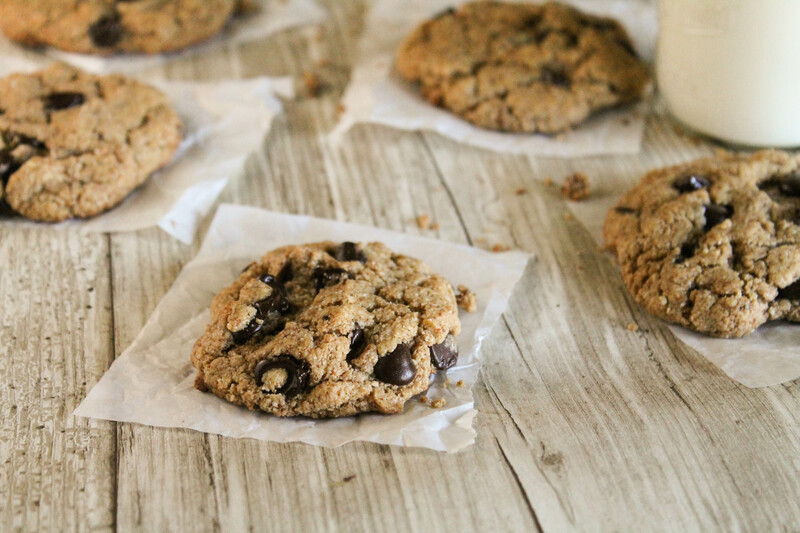 A chewy flourless chocolate chip cookie made with wholesome ingredients! 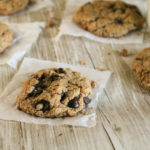 We love these Paleo and gluten free cookies, and since they are made all in your food processor using whole nuts, you’re likely to have all you need on hand! My son has developed quite the affinity for cashew butter. Problem is….it is SUPER spendy to buy in the stores, so we have always made our own. Raw cashews are very soft and very easy to turn into your own cashew butter! Simply whir at least 2-4 cups of raw cashews in a food processor (I adore my Cuisenart 14 cup Processor and use it all the time!) with some oil (we use avocado or coconut) until smooth and creamy, scraping the sides down if necessary. I currently use my faithful Blendtec Twister jar to achieve this in less than 60 seconds, but used a food processor previously. It is really THAT simple! But I digress. Cookies. Since we buy raw cashews in bulk, sometimes we have some to burn through some surplus before they get stale…..thus the invention of these cookies. I also figured people would be more likely to have raw cashews in their pantries over the spendy cashew butter….and that if they DID have butter, they may not want to use it all up in one fell swoop. However you decide to move forward, these cookies will be well worth your (brief) time. Chewy. Simple. Low in sugar. No flours or grains. These are a great afternoon snack! PS. If you fall in love with the ease and taste of homemade raw cashew butter, you should try using it in a reader favorite: Paleo 5 minute Muffins! But I have directions for using whole nuts in THAT one too!! Preheat oven to 350 degrees, and line a cookie sheet with parchment. In the bowl of a food processor, place the raw cashews and coconut oil, blend until mostly creamy, scraping down sides as necessary. Don't be tempted to add everything else in until this is done....it will seize with the addition of liquids. Add in the sugar, salt, and baking soda and process to incorporate thoroughly. Pulse in the liquids: the egg and vanilla, just to mix. Place 1.5 tablespoons of dough , a couple of inches apart on your prepared cookie sheet. and flatten gently with wet fingers or the back of a wet spoon. I use my favorite cookie scoop to do this! Bake for 8-10 minutes until turning just golden around the edges. Let cool to firm up, then transfer to an airtight container. These look absolutely perfect! 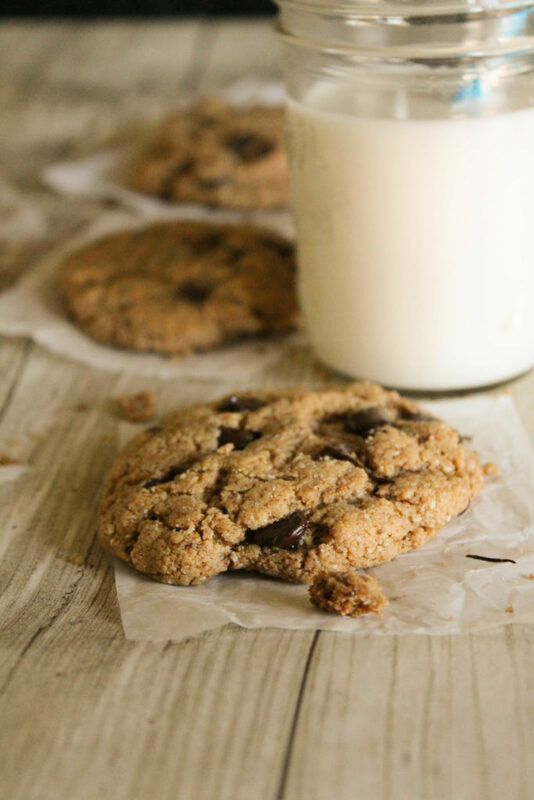 I can never say no to chocolate chip cookies and I think I need to make these for the holidays! Those look like some delicious cookies. I’m always on the hunt for flourless baked treats. Thank you! Super yummy! I was worried they might dry out but they were moist and delicious. Thanks! Great Steph….key is not to overbake the moisture out of them! Thanks for your feedback! I want to save the recipe but it says your site doesn’t allow pintrest pins! Except that you offer the buttion. Thanks for bringing that to my attention Michelle!! I will see what I can do!! Now try!! Successful on my end!